Thanksgiving this year is a first, catching this girl in pajamas, sipping mimosas. Generally the holiday is spent amongst extended family and friends. This year, the first time ever, will be a Mama and Chickens only affair. The PJ request, along with mac and cheese and caesar salad, comes via the babiest of chicks, averse to the traditional meal, and uncomfortable clothing, since childhood. PJ’s are a mainstay amongst the females in the coup. They’ve dragged Baby Pea into the fold, insisting she remove whatever last graced the runway and slip into fuzzy socks, baggy bottoms and over large tops. She thought she was getting Oldest Chicken. Instead she got demanding baby sisters who insist she play along. Adorable Nick and Nora’s will be featured but there will be pearls, coiffed hair, lined eyes and too much mascara. I eschew barbarian as a general fashion look. The Chickens inform it’s a holiday of comfort. As the mom, I’ve kinda had the corner on the dress code for most of their lives. It’s their turn. After all, we’ll be on Oldest Chicken and Baby Pea’s turf. When in San Diego as they say. And what says beachy like munching a turkey leg wearing pajamas and pearls expressing gratitude. Turkey, dressing, scalloped corn, green bean casserole, cranberry concoction, potatoes, russet and sweet, and gravy will grace the table. As will mac and cheese, caesar salad and french baguette. It’s the alternate Thanksgiving in the Chicken universe since they were wee. It’s also the reason the holiday was spent in our home. People don’t judge fussy eaters when they’re in their own homes. They even feel a bit superior. That was our gift. Come to our house for Thanksgiving. Leave feeling like a better parent. You’re welcome. I am stocking up on fixins to take to the beach. I won’t let on that it’s to ensure all the staples are “just right.” After all, I’m not in charge. There’s only so much a mother can unclench. Besides, if the dressing doesn’t have just the right ratio of sweet to savory, can we really call it a holiday? There is a newcomer to this year’s celebration. We start every holiday with a toast to The Norwegian. It’s a tradition wherever Chickens gather. Generally, it’s a mimosa and a few words. This year, mama’s amped it up a bit and I’m happy to share. Tried it last night. I am truly that exciting on any given weekend. Pull out your loveliest flutes, or coupe cocktails if you’re feeing retro trendy. Wet the rim and lower into a mound of cinnamon sugar. Fill the glass two-thirds with champagne and one-third with apple cider. 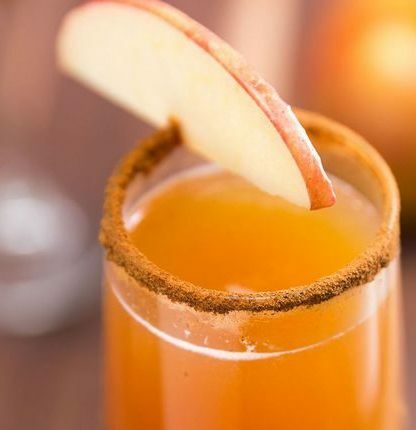 It’s a Turkey Day twist on a mimosa. The apple juice makes it feel a bit more seasonal. Not pumpkin spicey–we’re classy, don’t cha know. What’s that you say? You don’t start Thanksgiving Day with a cocktail? Well then, what on earth do you have to be thankful for? Pfft.